The All-Star break couldn’t get here soon enough for the Rangers starting rotation. The back-end of the Rangers starting rotation has been nothing short of a disaster over the last few weeks. Chi Chi Gonzalez and Nick Martinez had their shot, couldn’t deliver and now are back in the minors. Veteran Kyle Lohse made his Rangers debut Saturday night and wasn’t any better, giving up six runs in five innings in the loss to the Twins. However, there hasn’t been much to complain about the job A.J. Griffin has done since coming off the disabled list. Griffin had a 3.38 ERA in three starts since his return. It’s not just the fact that pitchers are getting lit up. It has become a moral victory for the club when the starter just makes it to the fifth inning these days. That’s how bad it’s been. Plus, when you factor in how the inability of not getting past the fourth or fifth inning puts a lot of mileage on the bullpen and a lot of pressure on the 1-2 combination of Cole Hamels and Martin Perez to go out and eat up innings themselves, it’s even more of a reason to be concerned. Yu Darvish, Derek Holland and Colby Lewis can’t get healthy quickly enough. Darvish is getting closer to returning from his latest trip to the DL due to shoulder discomfort. 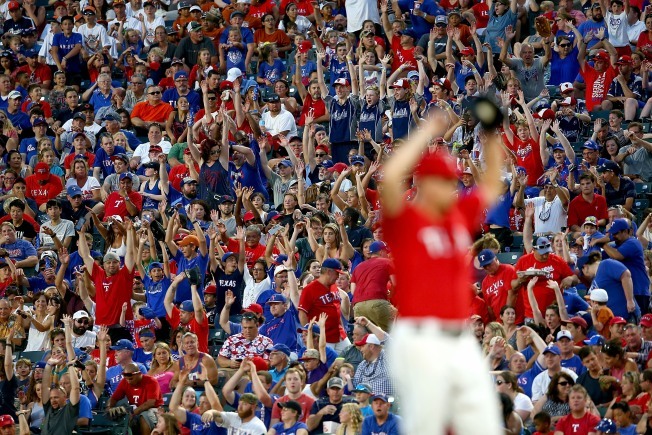 If all goes well in this rehab start Sunday evening in Frisco and he feels good Monday, the Rangers ace is expected to be back for their first series after the All-Star break. Holland has started throwing again after being on the shelf with shoulder inflammation and feels like he’ll be ready to go after the beak. Lewis is on the 60-day DL and isn’t expected to start throwing for at least two more weeks while dealing with a lat muscle injury. He may still be a few months away from returning. Names have been thrown around the rumor mill the last couple of weeks dealing with the Rangers possibly trading for pitching. If you do that, you will have to give up some top prospects in the farm system. Is it worth the gamble now if you are close to getting a couple of starters back? Maybe that’s on the mind of the Rangers brass because they haven’t shown any signs of making a “reactionary” move during this rough stretch. Plus, they do have pitching talent in the minors that needs just a little more seasoning before getting the call-up. All of this is the perfect example of why they say you can never have enough pitching.